City Rail Link (CRL) celebrated a major milestone today with the breakthrough from the Albert Street tunnels to CRL tunnels across the Commercial Bay site, Downtown Auckland. “We are transforming Auckland. Changing the way we live, move and play. It’s good for the city and great for its people,” says Mayor Goff. CRL’s CEO Dr Sean Sweeney, says, “The City Rail Link is a city-shaping project that will completely transform the way people move around the city. “Today’s milestone is an exciting step that brings us closer to delivering the project’s many benefits for Auckland. Dr Sweeney added that the nature of this project has made today’s milestone even more significant. The tunnels between the two sites, meet under the Customs Street traffic deck which was built last year to keep traffic moving while the work is carried out underneath. Dr Sweeney says now the CRLL contractor Connectus the McConnell Dowell and Downer Joint Venture team can complete the construction of the remaining third of the tunnel box and backfilling of the trench will continue until it is completely covered – expected to be mid-2019. Early next year the tunnels from the former CPO (Britomart) site will also connect to tunnels across the Commercial Bay site – providing a complete tunnel section from Britomart through to Wyndham St.
“This project continues to progress and take shape at pace and we’re thrilled that Aucklanders are starting to see the outputs of all the hard work that is going on right underneath their city,” says Dr Sweeney. St Barbara is the patron saint of miners and tunnellers. A statuette of her was carried by MBJV tunnel supervisor Laurent LeCalvez down the shaft at Mt Eden where tunnel boring machine Jeffie will be used to help divert a section of the existing Mt Eden stormwater pipe, which will be in the way of the CRL tunnel. Here are the latest construction time-lapse videos showing work around Lower Queen Street and inside the Chief Post Office (Britomart). There is also footage of the Fletchers’ Commercial Bay development where CRL tunnels are also being built. We’ve created a video about one of the most complex engineering challenges for the City Rail Link (CRL) to date - one which took two years of planning and preparation by NZ and international experts. In order to construct new railway tunnels under the Britomart train station, the building had to first be moved onto temporary foundations to keep it protected during construction. CRL’s Albert Street tunnel box construction is now about 63 per cent complete, with 264 metres of floor, 240 metres of wall and 156 metres of roof poured at the southern end of the trench. CRL contractor Connectus Joint Venture has also started backfilling the trench the tunnel box sits in. To date, more than 4,000m3 of material has been placed on top of the tunnel box, about 10 per cent of the total amount required. This has enabled more than 180 metres of temporary steelwork to be removed. C1 bulk excavation works continue in the trenches within the Chief Post Office (CPO) building and within Lower Queen Street in preparation for upcoming tunnel box construction works. The northern trench within the CPO building is now excavated down to 6m and the temporary concrete floor has been constructed for the upcoming mid-level propping installation. The corbels (the mid-level propping sits on these) have been installed along the trench walls and installation of the walers (steel beams) running along the edge of the walls is underway. Once the excavation of the very eastern end of the northern trench (what was the station toilet block) is complete, the installation of the struts across the trench will commence. In the southern trench within the CPO building, bulk excavation continues as does the demolition of the remaining columns and of the old pedestrian underpass. Down below deck in the station B2 platform level we have cut through the existing wall between the station and back of house where enabling works continue. The re-instatement of Albert Street is one step closer as the City Rail Link (CRL) reaches another significant delivery milestone. Today, the project started the backfilling of the trench which runs directly underneath Auckland’s busy Albert Street. City Rail Link CEO, Sean Sweeney, says the milestone marks the start of the last stage of the Albert Street works needed before the road can be re-instated and returned to road users and pedestrians – expected late 2020. “The team has been working very hard to get to this point relocating services, piling, supporting and diverting utilities, bulk excavation and constructing the tunnel box itself,” he says. Backfilling of the trench will take until mid-2019 to complete and a total of 50,000m3 of materials will be used to fill it. That’s the equivalent of 20 Olympic-size swimming pools. The material will be a mixture of crushed concrete, crushed rock, sand and flowable fill. People using Albert Street will see an excavator sitting on the construction deck moving materials down onto the roof. The project team will then use small diggers to spread the backfill within the trench. Mr Sweeney said that the project was grateful for the support of those who work on, live on and travel along Albert Street. “We’re grateful for the patience and understanding of our neighbours as we work to complete the project as quickly as possible,” he says. The Albert Street works are being completed by Connectus – the McConnell Dowell and Downer Joint Venture delivering the C2 contract. Last week, the project marked another major milestone on the C1 contract in Queen St with tunnel excavation at Britomart (the former Chief Post Office building) now proceeding at full steam. The contractors working on that contract, Downer NZ and Soletanche Bachy JV, completed the weight transfer of the 106-year-old Category 1-listed heritage building onto a series of underpinning frames, which will protect it from damage while City Rail Link infrastructure is built underneath. The load transfer of the former Chief Post Office (Britomart) building is now complete. DBSJV has been completing the weight transfer of the 106-year-old Category 1-listed heritage building onto a series of underpinning frames, which will protect it from damage while CRL infrastructure is built underneath. The remaining area of the building has now been load transferred onto the temporary foundations – this is a photo of frame 9, the steel underpinning frame that is now taking the weight of the eastern façade. Tunnel excavation can now proceed at full steam. Here are the latest timelapse videos of the CRL construction work in Lower Queen Street, at Britomart (the former Chief Post Office) and at the Fletchers Commercial Bay site. More than 90 per cent of the Albert St trench excavation is now complete. The CRL tunnel box being built inside the trench is also progressing, with 204 metres of floor, 156 metres of walls and 72 metres of roof completed so far. Once the full 350-metre length of tunnel box is completed, the trench will be back-filled and Albert St reinstated. Excavation is also continuing under the Albert/Customs St intersection, with the installation of supports for the trench walls and the removal of an old stormwater pump chamber. This work paves the way for construction of the tunnel box sections that will eventually link the Albert St trench to the CRL tunnels being built under the neighbouring Commercial Bay development. Construction of the tunnel structure under the intersection is expected to start later this year, with a full connection being made to Commercial Bay by mid-2019. In the Albert Street trench, 168 metres of floor, 120 metres of wall and 36 metres of roof have been completed by Connectus Joint Venture contractors. Thanks to a concrete bridge deck constructed over the Customs/Albert St intersection last year, motorists and pedestrians can continue to move across it while CRL contractor Connectus JV excavates underneath. Last month, an initial five-metre-deep excavation was made across the entire intersection to expose the piled wall to the neighbouring Commercial Bay development site. Over the next few months, the excavation will continue to about 13 metres in depth, after which breakthrough will be made to the CRL tunnels being built at Commercial Bay. Construction of the tunnel structure is expected to start later this year and a full connection made between the two construction sites by autumn 2019. A start is being made on excavating the 14-metre-deep trench that will contain CRL’s twin rail tunnels under Britomart Station and Lower Queen Street. The excavation follows two years of careful preparation work to protect Britomart Station’s historic Chief Post Office (CPO) building and support the ground before the trenching and tunnel construction begin. UNDERWAY: CRL Chief Executive Sean Sweeney (right) oversees the start of excavation with DSBJV Project Director Dale Burtenshaw. Our contractor Downer-Soletanche Bachy Joint Venture (DSBJV) will start by removing a five-metre layer of ground from Lower Queen Street. This will lower the ground level sufficiently to allow excavators to start digging under the CPO building. A single 25-metre wide trench will be excavated in Lower Queen Street and two 10-metre-wide trenches under the CPO (the two future CRL platforms will be located on the far sides of the station). DBSJV is also completing the weight transfer of the 106-year-old Category 1-listed heritage building onto a series of underpinning frames, which will protect it from damage while CRL infrastructure is built underneath. CRL tunnel box construction is expected to start at this location at the end of this year, once the trench excavation reaches the required 14-metre depth, and be finished in mid-2019. After this time, the trench will be backfilled, Lower Queen Street reinstated and the CPO rebuilt with basement and ground floor levels. The weight of Britomart’s historic Chief Post Office (CPO) building is being gradually transferred onto a series of underpinning frames. Pressurised hydraulic jacks lift the building by a maximum of 2mm on to a series of steel and post-tensioned concrete beams. These will protect the Category-1 listed heritage building from damage while CRL infrastructure is built underneath. Thanks to a concrete bridge deck constructed beneath the Customs/Albert Street intersection last year, motorists and pedestrians can continue to move across it while CRL contractor Connectus JV excavates underneath. Over the next few months, the excavation will continue to about 13 metres in depth, after which breakthrough will be made to the CRL tunnels being built at Commercial Bay. CRL has started excavating the 14-metre-deep trench that will contain the project’s twin rail tunnels under Britomart Station and Lower Queen Street in downtown Auckland. A single 25-metre-wide trench will be excavated in Lower Queen Street and two 10-metre-wide trenches under the CPO (the two future CRL platforms will be located on the far sides of the station). CRL tunnel box construction is expected to start at this location at the end of this year and be completed in mid-2019. Connectus has started pouring the concrete that will form the Albert Street twin tunnel roof.. Tunnel excavation under the Customs Street intersection is expected to start this week. This work will pave the way for construction of the City Rail Link (CRL) tunnel box section that will link the Albert Street trench with the tunnels being built under the Commercial Bay development. Thanks to the concrete bridge deck constructed over the intersection about a year ago, traffic flow will be unaffected by the excavation occurring underneath. The spoil will be removed from the site using excavators and conveyors. CRL contractor Connectus (the Downer-McConnell Dowell Joint Venture) will also be removing an old brick stormwater tunnel located under the intersection and replacing it with a temporary stormwater line that diverts water away from the location of the future CRL tunnels. The temporary line will be permanently diverted at a later date to connect with the Swanson Street line, created during the Albert Street stormwater realignment works last year. Construction of the tunnel structure is expected to start in this area later this year and a full connection made between the two construction sites by autumn 2019. This is how the Albert Street tunnel trench is looking today. Outside the Chief Post Office, excavations on Lower Queen Street are underway for construction of a pile cap on the new secant piles. A three-minute video showing drone and underground footage of the current Connectus construction of the tunnel trench up Albert Street. In the Albert Street tunnel trench, the Connectus construction team (McConnell Dowell and Downer) has poured the 5th wall, meaning 60 metres of the tunnel walls are now complete. Another Connectus crew is preparing for the first sections of the roof and tunnel. You can see the roof formwork. Excavations of the temporary former Chief Post Office floor are now underway. During the next two months, the temporary floor and polystyrene blocks will be removed down to B1 level. These are preparation works before the bulk tunnel excavation works can commence late July. Another milestone bringing us closer to construction of the City Rail Link tunnels that will make Britomart a through station. It’s the completion of secant piling which has been happening in Lower Queen Street outside the former Chief Post Office (Britomart). The secant pile walls will connect the excavation under Britomart to the excavation at Precinct Properties’ Commercial Bay development on the other side of Lower Queen St, where CRL tunnel boxes are being constructed. 70 secant piles had to be installed and the last one will be done tomorrow. Secant piling is construction of intersecting reinforced concrete piles. These piles lock together for strength and control any groundwater ingress into the tunnel excavation. A 70 tonne piling rig was brought in for the drilling. The middle wall of the first 12 metres tunnel box in Albert Street is presently being poured by the Connectus team (McConnell Dowell and Downer). The outer walls were done on Tuesday. The middle wall is not as wide as the outer walls with a width of 460mm (600mm for the outer wall). It is slightly taller with a height of 5 metres (4.6m for the outer wall). It requires less concrete with 28m3 of concrete or 6 concrete trucks instead of the 60m3 used for the outer walls. The steel formworks’ weight is doubled for the middle wall with a weight of 20 tonnes. The roof is scheduled for the end of this month. The CRL Connectus team (McConnell Dowell and Downer) is pouring the first 12 metres outer walls of the tunnel box in Albert Street. The team is pouring two walls, the east and west wall – the middle one will be poured later in the week and the roof is scheduled for end of May. 60m3 of concrete is needed for the two walls- that comes in 15 concrete trucks. The eastern and western wall are 600mm wide and 4.66 metres high each. The steel formworks weigh 10 tonnes for each outer wall. We’re a step closer to be able to start tunnel excavations in the former Chief Post Office (CPO) building. Those excavations will turn Britomart into a through tunnel. Contract one of the CRL works involves Downer NZ and Soletanche Bachy (DSBJV) progressing the CRL work through and under Britomart Station and Queen Street to the former Downtown Shopping Centre site which is now Precinct Properties Commercial Bay development. They've achieved a new milestone. This was that the first area of the CPO building that has been load transferred onto one of the structural steel underpinning frames. Why this is significant is because once all the load transfers are completed, we can then start tunnel excavations safely. The weight of the building is carried by its columns down into the building foundations. Before excavation of the rail tunnels can commence, a number of these foundations need to be removed – so the associated weight of the building firstly has to be transferred onto the underpinning frames. Each affected column is clamped by a steel collar which sits upon a steel beam located either side of the column. A hydraulic jack is located beneath each corner of the collar (four jacks in total per collar) and these jacks are used to exert a force on the underside of the collar equivalent to the building weight carried by the column. Each underpinning frame consists of two collars and the two beams. The beams span between two rows of diaphragm walls which were installed earlier during the project and are fixed to the capping beams which sit upon the diaphragm walls. Each frame supports two CPO building columns and the weight carried by both columns are transferred concurrently onto the frame during the load transfer for that frame. During load transfer, the force exerted by each jack is slowly increased by increasing the hydraulic pressure within the jack and it is closely monitored along with any ‘lift off’ (displacement) experienced by the column. When the jacks exert a maximum specified force (predetermined by calculating the weight of the building carried by each of the two columns) or the column experiences ‘lift off’, the load transfer is complete. Following construction of the rail tunnels and the subsequent re-build of the CPO building foundations, the weight carried by each column will be transferred back into the building foundations and the underpinning structures will be removed. All heritage values of the former CPO building have to be maintained - the project is working closely with the Heritage New Zealand. In January 2017, the Queen Street entrances to the Britomart Transport Centre closed for three years so that the CRL tunnelling work underneath could be done. These videos show construction in the former CPO (Britomart), outside the CPO in Lower Queen Street and the tunnel construction at Precinct's Commercial Bay development. At the Wyndham Street end, contractor Connectus JV is lowering 16 temporary formworks (frames) to the bottom of the trench, which will be used to cast CRL tunnel walls. Construction starts this week of the first 12-metre long wall section of CRL tunnels within the Albert Street trench. Meanwhile, the bulk excavation of the Albert Street trench continues towards the Customs Street intersection. The excavation and tunnel box construction is expected to be completed by the end of this year, at which time the Albert St tunnels will be joined to those constructed under the Commercial Bay development site. Work continues in and around the historic CPO building to prepare for construction of the CRL tunnels that will make Britomart a through station. Inside the CPO, installation of steel underpinning beams continues. The beams form an important part of the building support system during tunnel excavation. Guide walls have been constructed through Lower Queen St to prepare for secant piling. Made of reinforced concrete, these piles lock together for strength and to control any groundwater ingress into the tunnel excavation. The secant pile walls will connect the excavation under Britomart to the one at Precinct Properties’ Commercial Bay development on the other side of Lower Queen St, where CRL tunnel boxes are already being constructed. Tunnel construction beneath the CPO and across Lower Queen St is expected to begin at the end of this year and be completed in 2019. Work is about to start on CRL’s C6 contract to demolish two buildings and divert a 400-metre section of stormwater main at Mt Eden. The stormwater main must be diverted before any future station works at Mt Eden, as the alignment of the existing watermain clashes with the location of the future CRL tunnels at Mt Eden. Before the stormwater diversion, CRL needs to demolish apartments at 26 Mt Eden Road and the former Hyde Group building on the corner of Nikau and Ruru Streets. A specialist demolition contractor is undertaking this work, which will be completed by May. After demolition, shafts will be dug at Water and Ruru Streets. They will launch and receive the micro tunnel boring machine that will install the replacement stormwater line. The tunnel will be completed in a single drive from Water to Ruru. A third shaft at Mt Eden Road will provide future access to the watermain via a manhole. This work is expected to be completed by autumn 2019. In addition to the stormwater realignment, pollutant traps will be installed at Boston and Normandy Roads as part of the stormwater network improvements for Auckland. They will capture large and non-biodegradable waste such as litter and coarse sediment to prevent it reaching waterways. Each trap takes about four weeks to install. Guide walls have been constructed through Lower Queen Street. These are for the secant piling (construction of intersecting reinforced concrete piles) which is getting underway. Made of reinforced concrete, these piles lock together for strength and to control any groundwater ingress into the tunnel excavation. The secant pile walls will connect the excavation under Britomart to the excavation at Precinct Properties’ Commercial Bay development on the other side of Lower Queen St, where CRL tunnel boxes are being constructed. The pits are excavated to the depth of the polystyrene blocks. The blocks are shaped and interlaced together in the pit with rebar cages either side. Concrete is then poured into the cages around the polystyrene and left to set. This forms the guide walls. To construct the secant piles, a new 70 tonne piling rig has been brought in and will start by drilling into each polystyrene section to guide the drill in the correct direction and then continue drilling down to the depth of 16m. Reinforcing will be place and concrete poured to lock the piles together tightly. There will be a total of 70 piles. The construction of the Albert St tunnel box is going well. The first 12 metres of waterproofing has been completed for the first slab so reinforcing works have just started. The first slab will be completed on Saturday and the first pour will begin on Monday. Two tonne bundles have been individually lifted between the struts to the trench floor by contractor CRS Ltd. It takes 8 steel fixers 5 days to tie together one floor slab (12 metres). 20 Tonnes of steel are used for the first slab. She's off on a long journey home. Sandrine heads back to France. The bright red 90-tonne piling rig has finished working around the historic CPO (Britomart) building for contractor Downer Soletanche-Bachy JV. Thanks for your great work Sandrine and all those who worked with her. In Albert Street, construction of the first tunnel box is starting. It takes three days to install the first 12 metres of the waterproofing. Downer Soletanche JV workers have begun the final concrete pour for the 64th and final diaphragm wall (D-wall) in the CPO. 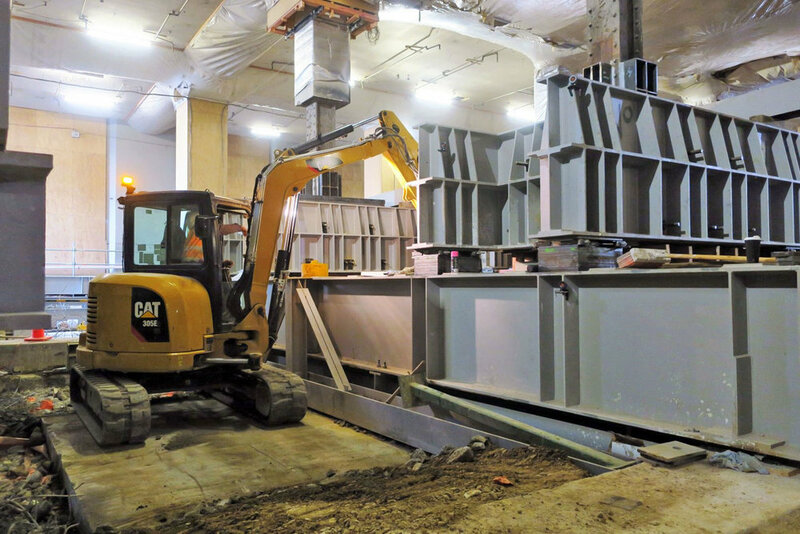 The walls were required to support the CRL tunnel excavation under Britomart Station. The D-walls not only provide soil retention and control groundwater ingress but support the weight of the historic building during tunnel construction. This also means the end of the work there for the big piling rig Sandrine. The 90-tonne compact rig Sandrine moved into the CPO in September 2017 to dig those 15 to 20-metre-deep wall panels that form the structural support for the CRL tunnels.